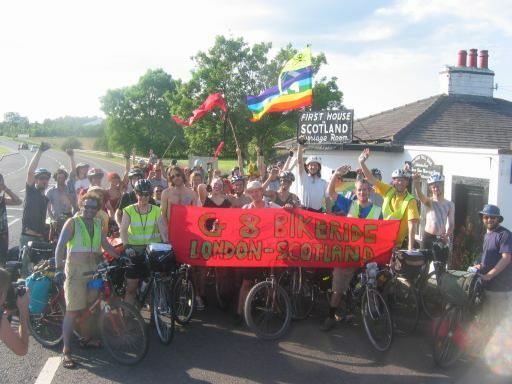 In June 2005 a group of approximately seventy cyclists set off from London to ride to the G8 Summit in Scotland. After nine days of riding and two rest days the group celebrated arriving at Talamh Housing Co-op in Lanarkshire before continuing on to Edinburgh, Stirling and Gleneagles. Here is a map showing the places they stayed along the way. The organising website and ride blog (originally at g8bikeride.blogspot.com) are archived here for posterity.